Comparisons between Jakob Forsbacka Karlsson, a sophomore center on the No. 5 Boston University men’s hockey team, and Patrick Bergeron, the famed Boston Bruins center, have become commonplace. After Thursday night, it’s clear why. With No. 10 Union College visiting Agganis Arena and seven of Forsbacka Karlsson’s teammates playing in the gold medal match of the 2017 World Junior Championships, the Swede virtually carried the Terriers on his back. In what was ultimately a 5-4 overtime win over the Dutchmen, “JFK” netted his first collegiate hat trick. 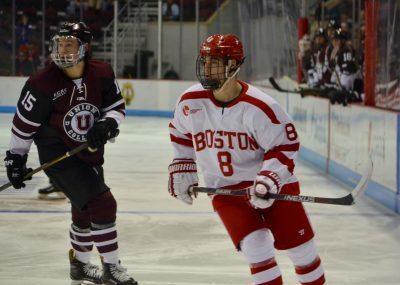 When asked about the 20-year-old, superlatives flowed forth from David Quinn, BU’s head coach. Quinn’s assertion holds water, too, as Forsbacka Karlsson, a Bruins’ second round selection in the 2015 NHL Draft, found net when BU (11-5-2, 4-2-2 Hockey East) needed him the most. The first came 8:51 into the first period, when he corralled a feed from classmate Bobo Carpenter and fired above goaltender Alex Sakellaropoulos’ shoulder to make it 2-0. Then, with a 4-3 defeat looming late in the third period, BU got a lifeline of sorts: a rare power-play chance. “JFK,” as he did all game, seized the moment, ripping a wrister bar down and sending the game to sudden-death overtime. Come the extra stanza, as if anyone else would rise to the occasion, the sophomore starred again. A broken play in front of Sakellaropoulos led to “JFK” finding himself in the slot, only to deposit the game-winning tally and cause Agganis to erupt. Doyle Somerby, BU’s senior captain, had nothing but praise for Forsbacka Karlsson, one of the team’s two assistant captains. Even though “JFK” dominated the plot against Union, perhaps the biggest takeaway was how he and the Terriers fared without the aforementioned World Juniors group. Forwards Clayton Keller, Kieffer Bellows, Patrick Harper and Jordan Greenway, defenseman Dante Fabbro and Charlie McAvoy and goaltender Jake Oettinger are all vital cogs for BU. While they were suiting up for the U.S. or Canada, many doubted how the Terriers would fare against the Dutchmen (14-5-2). To put it lightly, they quelled the doubters. 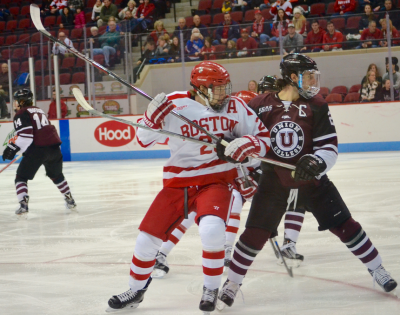 Another element at play is what these two points mean for BU in the long run. Union is likely a contender for the national title, and this result will prove crucial when the NCAA Tournament comes around. To put it lightly, this win, as sparked by Forsbacka Karlsson, was a big one.